The name has been used with some frequency, and after 1940 it has been often mentioned in unfavorable terms. Some people say military strategists are always a war behind real events, and the Maginot line is often invoked as a proof. 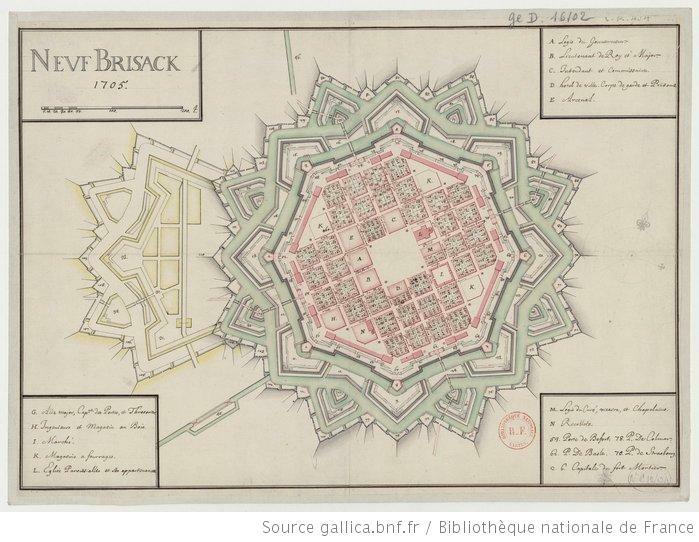 Vauban invented for Louis XIV the concept of “Pré Carré”, a safe national space protected by border forts. When the Maginot line was conceived the horrors of WWI were still recent; a conflict in which the stabilization of fronts for years led to a complete destruction of woods, cities and people. 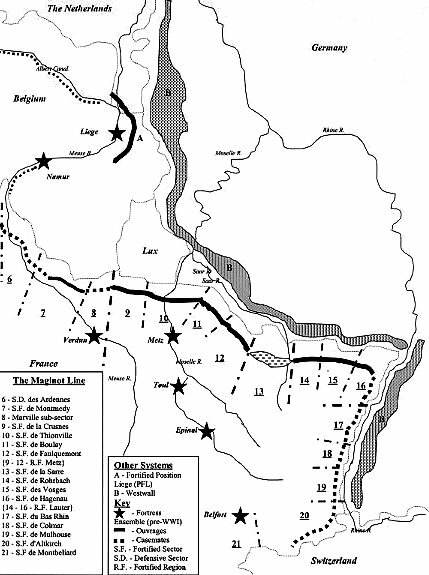 The idea of a static war was the argument supporting the most sophisticated trench, as to ensure a total block from Switzerland to the sea, regardless of the landscape or territory in each section. But this territorial fortification was overwhelmed by a completely different form of war, which also had advocates in France (a certain Charles de Gaulle), but one for which the army was not ready. 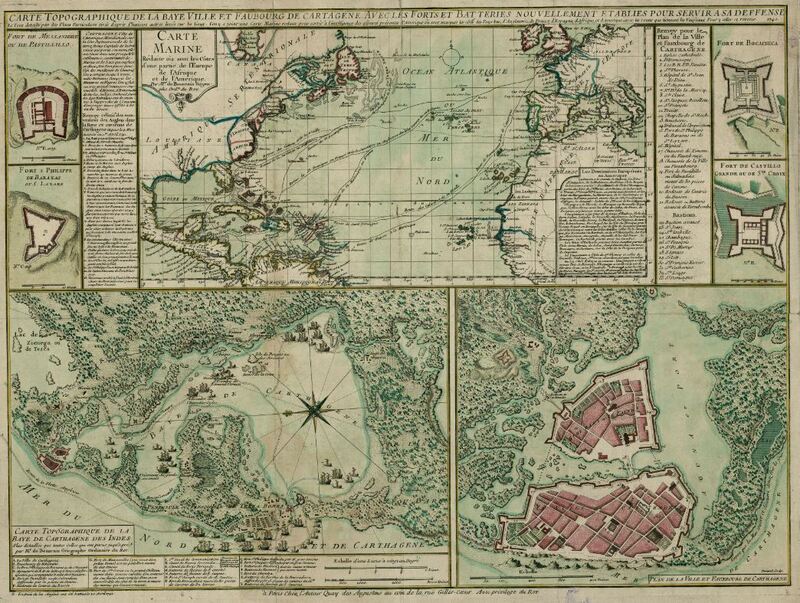 Despite the exhaustive aspect of the layout, I have seen no reference to border cities; I suppose they were protected by the fortifications, and urban planning was almost none at that time. Cartagena de Indias was established in 1533, becoming a relevant port for the slave trade of the Spanish Crown in the Caribean sea (in a route in which Portobelo in Panamá was the main exchange point of slaves for Peruvian gold and silver, and Havana was the gate to the Caribean sea). 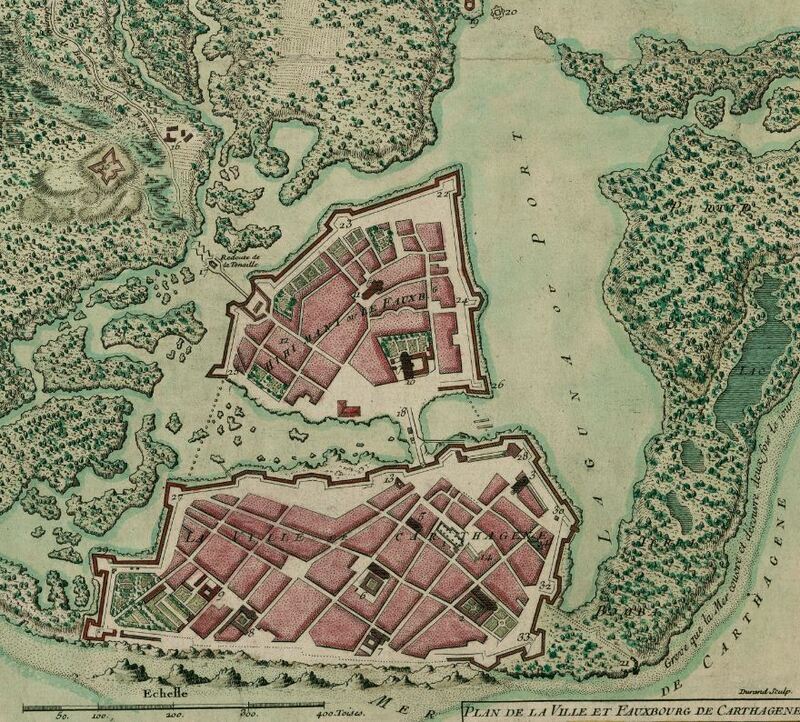 The city was subject to siege several times (the first in 1544), mainly by French and English pirates, and fortified by Spanish and Italian engineers with an african workforce. The walls, whose cost to the crown was widely commented, still exist for the most part, as well as some forts around, as the San Felipe de Barajas Castle. The two main islands are today united, and the colonial architecture can still be seen, mixed with more recent elements. When you compare the old map with the current image, please note that the former represents the west in the lower part of the image. I just finished two weeks ago “Victus: Barcelona 1714”, a recent book by Albert Sánchez Piñol on the Siege of Barcelona during the Spanish Sucesion War. It makes a good read, and it is also a good introduction to poliorcetics, or the art of siege warfare as conducted during the Enlightment. 2013 will not bring the once expected municipal shared bike system (the current economic crisis does not seem the good time for it), but we have a new bike lane through central Madrid. After years of a strange situation in which the bike network in Madrid was just a peripheral ring more fit for leisure than for commuting, at least a small change. The bike trail along the Manzanares and the western part of the bike ring are now connected to the eastern part through calle de Alcalá and Calle O’Donnell, configuring a good route for tourists, even if there is still a lack of good connexions with some jobs concentrations. 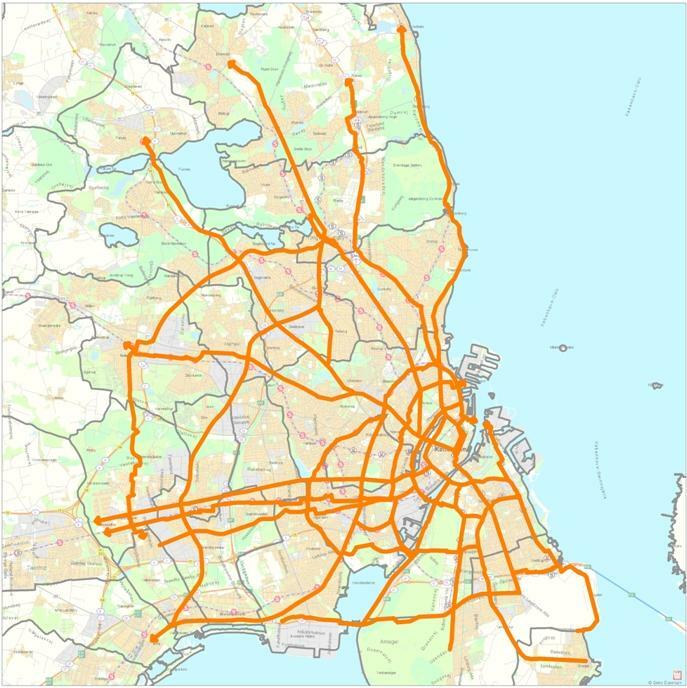 The municipal bike paths map (accesible through the internet, you must notice that the default view also includes recomended streets that have no proper bike lane) shows more clearly the situation; there are still a lot of unconnected bike lanes sections, without a proper grid. On the metropolitan scale the situation is far from easy; the Bicisur project is led by the Consorcio de Transportes (the regional transportation authority) to make the bike a real alternative to mass transit and private cars in southern metro madrid, along the metrosur line (a curious subway ring that is in an excentric situation). In 2011 the India Government decided to launch a National Public Bicycle Scheme to promote cycling as the last mile connectivity in 10 cities. On average, 43,7% of indian households had a bicycle in 2001, a figure that rose to 46% in urban areas. 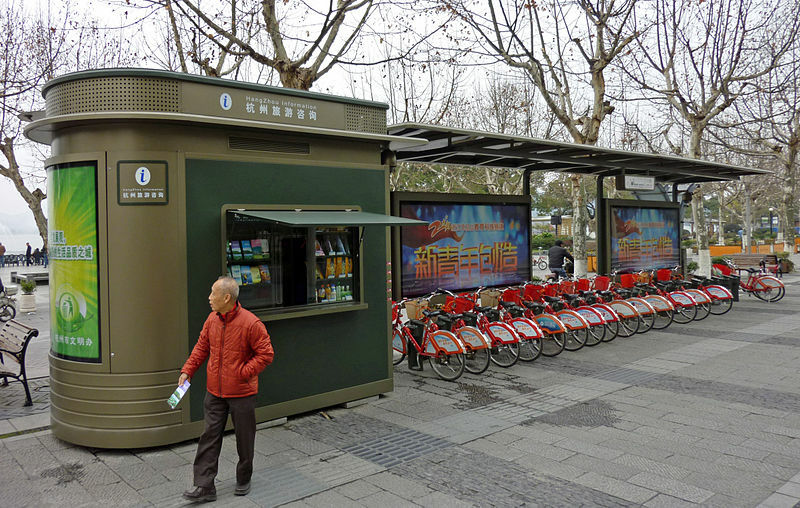 The National Government issued a draft toolkit for public cycle sharing systems that studies such systems in other countries, mainly Europe and China. Pune (Cycle Chalao estimates 2012): Rs 24.000 per bicycle (334 euros) (costs are higher as the system is not fully automated). According to the toolkit, a high quality cycle sharing system with 5.000 cycles can be established in an indian city for Rs 40 crore (5,5 million euros). Just in order to compare costs, Velib, the Parisian system, started in 2007 with 7.000 bikes and start-up cost estimated at 140 million euros (paid by the firm that got the external advertisement concession for the whole city, not the public administration); a 1 hour ride costs 1 euro. A bicycle from Cycle Chalao!, a bike sharing system set up in Mumbai and Pune in 2010 that has ceased to exist since, but has provided an interesting local experience. And now, for a special study, by a Psychosociologist (Mrs Catherine Espinasse), on night biking at Lyon, Paris and Poitiers. It is worth noticing that bike use in France is way smaller than in the Netherlands or Denmark. The interest of this text is to grasp the motivations to use a bicycle under special conditions that initially seem less adequate. 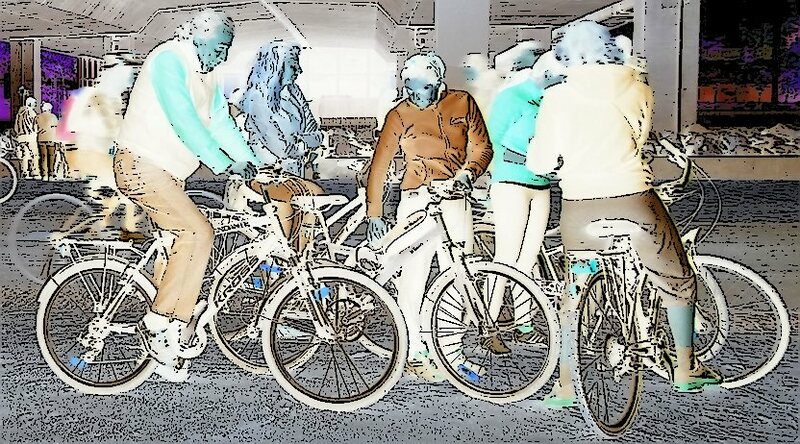 It results from 60 open interviews with urban bikers (30 in Paris, 20 at Lyon and 10 at Poitiers). Unconditional users, using their bicycle everywhere and as an almost exclusive transportation mode. Prudent bikers (mainly women) that feel vulnerable and do not use it at night. Rationalists, which have become unconditional users. For bikers in Lyon and Paris the bicycle seems a way to solve the lack of night mass transit, and also to rediscover city lights. At Poitiers, night biking seems associated to young users going to clubs and parties. Overall, biking seems not so much a “soft mode” but an “active mode”, as well physically as on citizen involvement terms. Do you think night biking is possible where you live? According to the last stats, 16% of all trips in Denmark are by bicycle, and for those under 4 km the share rises to 24%. 44% of all households don’t have a car. With many good conditions for cycling and a population used to it, Denmark is anyway subject to a certain rise in car ownership and use, and cycling on a national level decreased from 1990 to 2008. But even so, bike use has increased in Copenhaguen. 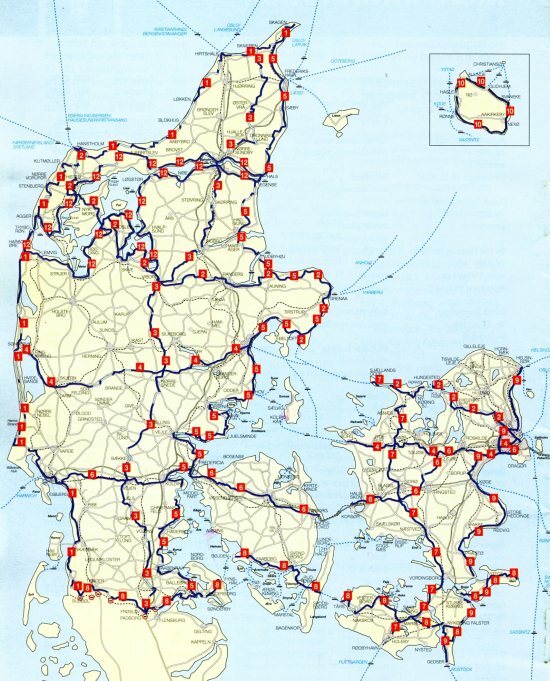 Since 1993 there are 11 national cycle routes, with a total length of 4.233 km. As they usually follow such elements as the coast, with much less stringent layout requirements than car roads, and they are mainly tourism and leisure oriented, they can have great lengths. The initiative’s interest must be weighted with more day to day projects, as Copenhaguen’s Cycle Superhighways, a commuter-oriented project that is to remind to anyone with a certain urban planning culture the “finger plans” so recurrent since the postwar years in this nice city. The standard bike lane width is 2,2 m, which have been extended to 2,5-2,8 m in Copenhaguen. Bikes (1) What do 57 million euros buy in Amsterdam? 27% of all travel in the Netherlands are by bike (according to Pucher & Buehler, 2008), the highest ratio in the world. The average Dutch pedals 2,5 km daily (Spaniards just 0,1, as well as in the US…). Over the last 20 years the use of bicycles has increased by 40% in Amsterdam, to reach 490.000 daily trips in 2012 and 2 million kilometers daily, and over 3.500 bikers per hour in the most used segments. There is a relevant congestion that generates a third of accidents. 56% of the severe traffic accidents imply a bike rider. 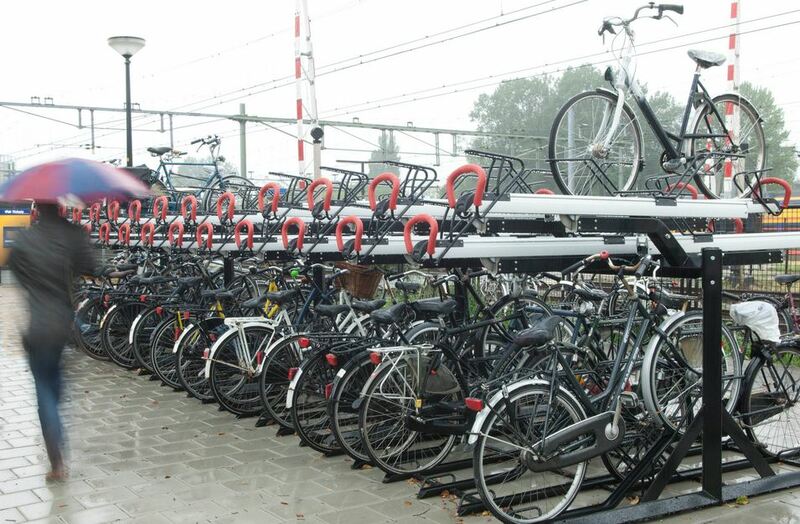 Amsterdam City plans to invest 57 million euros up to 2016 to improve the use of the bicycle. There will be 15 new km of red, high capacity, bike paths, and the main thoroughfares will be enlarged, giving as much priority as possible to cyclists. Up to 2020 there will be a coordinated investment of 120 million euros involving other administrations to solve the most conflictive nodes of the network, but the priority (90 millions) will be allocated to 38.000 new bike parking places (2.368 euros per spot). According to the city, the investment on bicycles is the most profitable for euro spent. Just to compare investment magnitudes and the number of implied persons, I will use a Madrid example. The Cuatro Caminos underpass, opened in 2005 with a 540 m length (and a complex engineering to make the four lanes way cope with many buried infrastructures) has cost, according to the press, 25,7 million euros, to absorb 70.000 cars a day. If the 57 million euros in Amsterdam’s investment were to benefit just 30% of its bikers in 2012, this would mean some 147.000 daily trips, so the cost in euros/trip would be similar, but the CO2 and other greenhouse gases and pollutants emissions would be clearly down, as well as the associated nuisance. 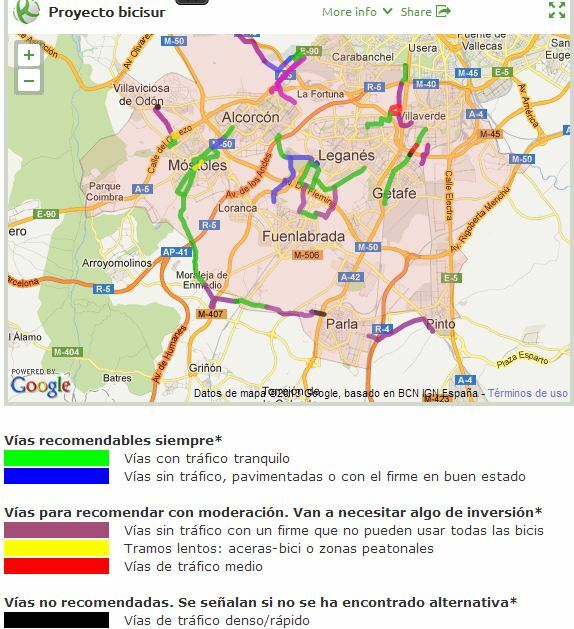 Besides, the Amsterdam investment should tackle congestion city-wide, while Cuatro Caminos is a point solution. Taking into account that building costs in the Netherlands are probably higher than in Madrid, a more adjusted intra-city comparison would be even more advantageous to the bike. I’ll begin by talking about an American; not a bike runner that has become sincere, but a certain Steve Jobs (even if I write in Windows) that apparently said he thought that computers were to be bicycles for the mind. He meant that the energetic output of the human body when moving, poor when compared to that of other animals, was better than that of the condor when using a bicycle. Because that is what a bicycle is for, as it multiplies the human muscular efficiency. 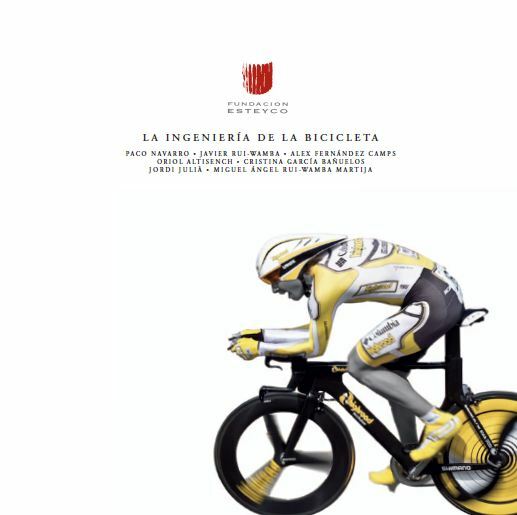 Fundación Esteyco has published in 2010 the book “La Ingeniería de la Bicicleta”, with the contribution of a number of authors. It is a wonderful reference on the object itself, its origins, the problems and solutions raised in engineering terms, and, why not, the sheer aesthetic beauty it sometimes shows. The last chapters focus on the engineering of the spaces the bikes use (from the Tour de France mountain roads to the urban spaces) and the bike as an urban transportation system. There is also a set of short texts from authors as Hemingway and Delibes, and artistic visions on the bicycle. 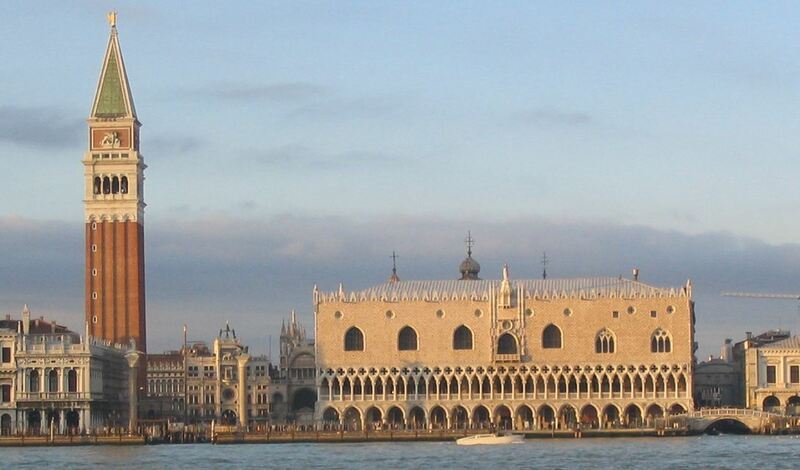 The Palace of the Dogi in Venice is one of the most impressing power headquarters I have visited. Its presence on the bay, showing itself clearly to the visitor, is noteworthy; it shows no impressive beauty in itself from the distance, but it is well inscribed in an overwhelming façade. The most interesting thing is what cannot be seen from outside (or what can be seen but not understood). The Palace houses the halls for the different councils that ruled the Republic, some of which had to take a large number of councilors. The logical solution from a structural viewpoint would have been to put these halls on the ground floor, with a majestic roof in the center of the courtyard, and then have the other, smaller dependencies, rise around and better using a masonry structure. But in this case the council halls were located on the highest level. 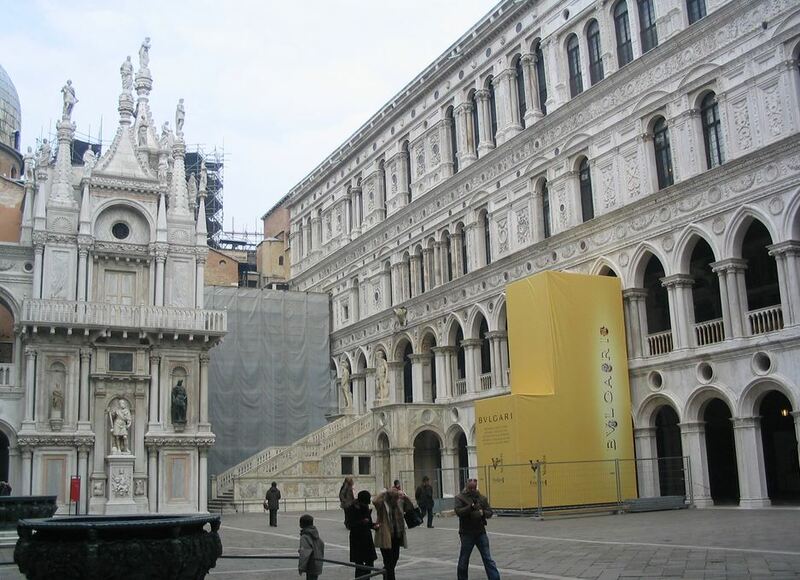 This explains a lighter appearance of the two lower levels, giving a clear quality to the St Mark’s square and the urban front to the Grand Canal (even if beyond the colonnades you have massive walls), and the heavier appearance of the upper floor, in which the large halls are. On the corridors between these large halls there are giant maps of the world that show the vision that the navigator’s Republic had of itself. 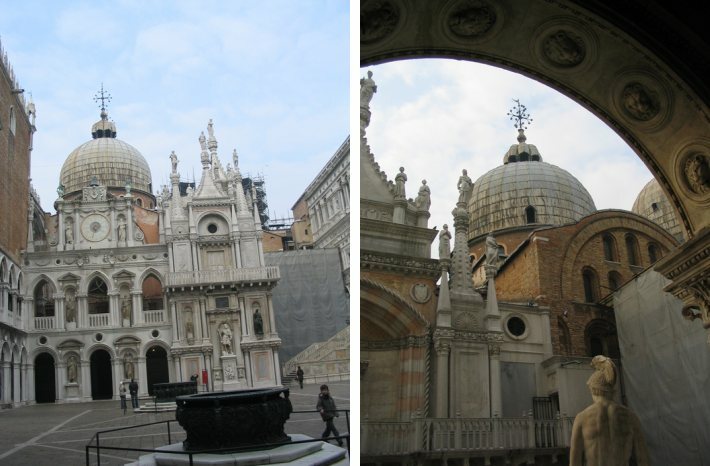 The entire building is a palimpsest of styles and ways to decorate and organize an architecture, with surprising variations in corners, but always integrating that need to give a ceremonial access to the upper level to a sizeable number of councilors, having as a courtyard companion the St Mark’s Cathedral.